Some useful information from GM TechLink regarding the GMC MultiPro Tailgate. When the BCM receives a release command to release the primary tailgate or inner (auxiliary) gate, it applies a brief pulse of voltage to the appropriate left and right pickup box latch relay control circuits, which energizes the coil side of the relays. The switch side of the appropriate left and right latch relay then momentarily closes, supplying a brief pulse of battery positive voltage to the left and right pickup box primary tailgate or auxiliary endgate latches. (Fig. 27) The latches activate to release the gate. The inner auxiliary pickup box endgate must be in the latched position before commanding the primary tailgate to release. The BCM disables the primary tailgate release function if the inner auxiliary pickup box endgate is open or ajar. Well for now, there are many 2019's sitting on the staging lots in Fort Wayne Indiana due to warped or ripples windshield glass and problems with paint. They will all have problems. over and smooth out the rough patches. Perhaps they do this to meet the "demand" we consumers impose? Auto Companies need to stop and smell the roses. millions of dollars in dealership reimbursements and civil lawsuits due to faulty parts, poor engineering or assembly. BUMP. How's everyone liking this tailgate? Love it. So easy to load my dirt bike. I agreed, originally thought it was a gimmick... however, after using it I really like it. Having a bad knee (recent ACL) this gate is amazing for getting in and out of the bed - extremely easy! I love mine. Spent yesterday moving items to storage and used the stair function about 30 times. Those over 50 will wonder how you lived without it. I don't see any problem with the trailer hitch, I'm standing right there when I release the tailgate and should recognize there is a hitch at my shin. I knew most would love it. Can’t wait to get mine. Usually when people complain about a part , is when they wish they had it. I agree with you, wish it was an option. The real question is. does it fit right up to the Silverado's. I though I read somewhere that the beds are slightly different. Is there any preventative maintenance that can be done with the tailgate latch? Mine ‘18 seems to be getting a little tough to open and although it’s under warranty I thought if I could lube, grease, silicone, spit on, or whatever it takes to loosen it up it’d be nice. Thank you for your consideration and as a side note I will not be having a garage sale this weekend. Anyone know how difficult it would be to upgrade the rear view mirror? My trail boss came with a "dumb" mirror. No auto dim, no compass, no onstar, no temp read out, nothing. I'd like to at least have auto dimming, compass, and temp read out. Rear view mirror camera would nice too. Is there any chance that the wiring is already there for it and I just need to simply replace the mirror and plug it in? I've seen a lot of aftermarket options and some of them look pretty neat, but for the most part they attach to the existing mirror and I'd like to find something that is as close as possible to stock looking. 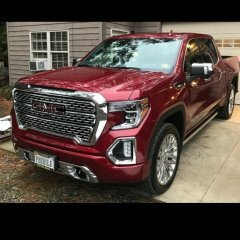 Hello guys, I recently bought a new 2018 Sierra Denali, loving the truck. All that enjoyment came to an end this morning when i was going into costco and hit the curb of the parking lot entrance at about 15 mph. The whole truck bounced off of the curb so it felt nasty. I got out and checked the damage and I shred a bit of the tire and scratched the rim. I am very paranoid as if it could have damaged anything internally, what do you guys think? Could I have damaged something else? Here is a picture of the visible damage. Edit: it is the front driver’s side wheel. 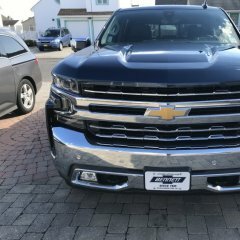 A few months ago we started to notice something on our 2019 Silverado that no owner of a brand new vehicle wants to see. Rust. Specifically on our rear bumper, just around the plastic step. It wasn't huge and didn't spread very far from the edge... but we couldn't stop noticing it. There was no excuse for rust on a 8 month old vehicle with less than 10,000 miles. The photo above shows the minimal but noticeable rust patch. It was even happening on both sides and in the same place. The issue seemed odd. Unfortunately, we've just been too busy to bring it by to our local dealership for them to look at. 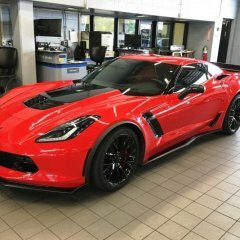 Lucky for us, our procrastination has paid off, because in the time between us first noticing the problem and getting off our lazy asses to drive to our dealer, GM has released a TSB about this very issue. It appears that on most of the early trucks, production of the bumper was completed incorrectly. The steel assemblies should be bent into shape then chrome plated. But that didn't happen in a small part of the early bumpers. The supplier bent the area around the side step after the bumper was chromed. The new folds in the steel damaged the chrome, cracking it and making the truck susceptible to rusting. What's the fix? If your bumper is rusting already, Chevy and GMC will replace it. If it has not yet started to rust, they will apply an automotive grade wax/sealant to prevent rust in the future. 1. Give your truck a bath for heavens sake! 2. Clean the rear bumper step area with a hose or pressure washer. Front and back! We find lots of dirt collects behind our step in the bumper assembly. 3. Inspect around the foot step area and behind the foot step area. We found rust in both areas! 4. If in doubt, wait for it to rust and kindly ask for a new rear bumper. Our dealership, Banks Chevrolet in Concord, NH has been great getting our rust issue fixed. Our service adviser Justin has kept us in the loop during the repair and gave us a loaner Silverado LT while they have our truck. He even made sure any other outstanding service updates are also applied to our LTZ while it was in the shop. As it turned out, there were six open issues that needed addressed. Here's the official Service Update you can print out and bring to your dealer when you take your Silverado or Sierra in for service.